More than 475 studies have examined the role of this cruciferous vegetable in cancer prevention (and in some cases, cancer treatment). The uniqueness of cabbage in cancer prevention is due to the three different types of nutrient richness found in this widely enjoyed food. The three types are antioxidant richness, anti inflammatory richness, and richness in glucosinolates. There should be only a few outer loose leaves attached to the stem. If not, it may be an indication of undesirable texture and taste. Avoid buying precut cabbage, either halved or shredded, since once cabbage is cut, it begins to lose its valuable vitamin C content. Keeping cabbage cold will keep it fresh and help it retain its vitamin C content. Put the whole head in a plastic bag in the crisper of your refrigerator. Red and green cabbage will keep this way for about 2 weeks while Savoy cabbage will keep for about 1 week. I didn't know who Chef John Besh was, until one day I was watching Paula Deen's cooking show, and her guess was, Chef John Besh. So I just had to do some research on Chef John Besh. A few weeks ago, I was watching John Besh's cooking show. 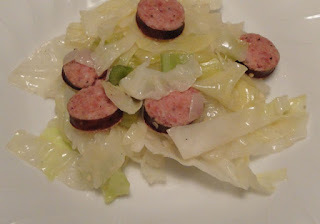 One of the dishes he was cooking was “cabbage and sausage”, so I gave it a try. This recipe pretty good. Use bacon grease and omit the olive oil and butter. And use your favorite smoked sausage. In large pot, add olive oil and melt butter, over medium heat. Add onions, celery, salt, pepper and bay leaf, stirring, cook for 3 minutes. Add smoked sausage, cabbage and garlic, stirring, cook about 5 minutes. Cover cabbage with water, bring to boil, reduce heat to simmer, cover, cook about 30 minutes, until cabbage is tender. Discard bay leaf. Add salt and pepper and serve. Enjoy! I enjoy having cabbage either raw or cooked. While my kids prefer having them in coleslaw style. Thanks for sharing such useful info. Hope you're going to have a great week ahead, dear. My hubby would love this one Christine. I can't eat cabbage for some reason. Bothers my tummy. Yet I can eat smoked sausage and do quite often. thanks for helping me to make delicious sausage. I love John Besh--he's one of the quintessential New Orleans chefs. I didn't know all that about storing cabbage in such a way to keep its vitamin content. This looks delicious! I never had too much cabbage growing up. My husband loves the stuff though. I will have to whip this up some evening to surprise him. Were you watching John Besh's cooking show before or after you saw him on Paula Deen? His' recipe's pretty good! I started watching Chef John after I saw him on Paula's cooking show. We love cabbage whether it is raw or cooked. Adding sausage makes it even better. I'm going to check out the Chef also.